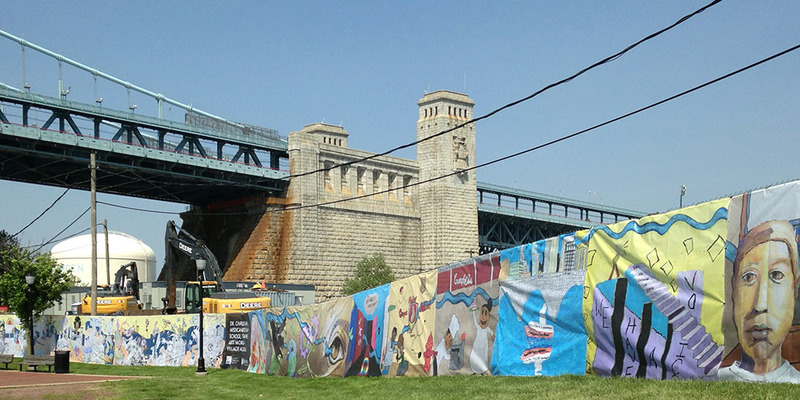 A previous public art initiative of the Rutgers–Camden Center for the Arts, this 670-foot mural created by Camden schoolchildren was unveiled in 2018 on the Camden Waterfront. On Jan. 24, Bloomberg Philanthropies announced that Camden, New Jersey has been named a Bloomberg Philanthropies 2018 Public Art Challenge winner. The city will receive $1 million for “A New View,” a public art project that will transform sites plagued by illegal dumping along major transit corridors into dynamic art spaces, inspiring residents and attracting visitors. It will include art installations and creative programming at several sites along Camden’s rail, road, and bike routes. As a lead partner in “A New View,” Rutgers University–Camden will encourage residents to combat illegal dumping of household and or industrial waste through education efforts and public-private partnerships. The city also aims to strengthen the local artistic community and improve the quality of life for Camden residents. Led by the urban redevelopment nonprofit Cooper’s Ferry Partnership and the Rutgers–Camden Center for the Arts, the collaboration will engage independent curators, the Camden Collaborative Initiative environmental consortium, the Camden City Cultural and Heritage Commission, local businesses, and residents. In February 2018, Bloomberg Philanthropies invited mayors of U.S. cities with 30,000 residents or more to submit proposals for temporary public art projects that address important civic issues and demonstrate an ability to generate public-private collaborations, celebrate creativity and urban identity, and strengthen local economies. The Rutgers–Camden Center for the Arts (RCCA), a distinguished arts organization recognized by the New Jersey State Council of the Arts, provides performances, exhibitions, education programs, and community projects that inspire a full appreciation and enjoyment of the arts. The RCCA creates meaningful opportunities to participate in the arts, advances the central role of the arts in pre-K-12 education, and increases awareness of the arts as essential to cultural, economic, and community vitality.